After starring as Frankie Valli in the national tour and Las Vegas production, Aaron De Jesus brings his Jersey Boys performance home to NYC, leading the off-Broadway production of the Tony-winning hit bio-musical. You should get yourself over to New World Stages to hear him just slay these beloved The Four Seasons songs live. BroadwayBox caught up with Aaron to talk about how he maintains this monster of a role, how he keeps his voice healthy, and his passion for travel. 1. From your pre-show to what you’re doing onstage, how has your Frankie Valli changed through the years? 2. This is such a major sing. What is the key for caring for your voice, especially during the winter months? Any secret weapons you keep backstage just in case? The key to caring for my voice isn’t much of a mystery. It can be summed up in five points: rest, hydration, diet, exercise, and vocal training. The voice is an extremely delicate part of the body as a whole. You can’t focus on the voice and ignore the remainder. It’s all connected. - Rest is the key to recovery. I try to get a solid 7-8 hours of sleep daily. - Because so much of the body is water, it needs to be constantly replenished. I drink constantly throughout the day and during the show. Certain fruits like watermelon can really help with hydration as well. - Diet isn’t about eating salads and avoiding tasty treats. It’s knowing your body and how it can react to certain foods. I am sensitive to certain foods for different reasons. I find that avoiding them helps my voice stay clear. - Exercise keeps the whole of your body healthy and strong. Regular running and weight training work very well for me. But I have to be careful not to overextend myself physically. It can cause excess strain on the voice and body. - Most of the Frankie’s train with an extraordinary voice teacher named Katie Agresta. She specializes in rock singing and has been keeping me vocally healthy for years. I have one secret backstage that I use somewhat often. I drink Pedialyte for a little extra hydration during the show. 3. Having been a long-time Vegas resident, what are some great things locals know about that tourists seldom do? We haven’t lived in Las Vegas for three years now—so much has changed. In our almost decade of residency, we watched it change drastically. I don’t think any city in the world changes as rapidly as does Las Vegas. I have two favorites that remain the same. 1. Valley of Fire State Park. It’s an amazing area of natural rock formations in a variety of colors from deep red to orange, yellow, and white. It’s a 45-minute drive from the strip, but worth the trip in my opinion. 2. The “Fountains at Bellagio” is still one of the best things to see on the strip. If you want a new perspective, cross the street and watch a show or two from the top of the Eiffel Tower at The Paris. You can still hear the music, and the view is spectacular. 4. You’re also an avid traveler, having been to 22 countries and 47 states. Tell us one country and one state everyone should experience at least once in their lives. Iceland is one of the most amazing places I’ve ever visited. It is super trendy right now, and for good reason. I’ve never really seen anything like it: black sand river beds, glaciers peppered with volcanic ash, seemingly impromptu waterfalls and geysers, moss covered lava fields, and jagged mountains shooting out of vivid green fields. It’s stunning. It’s cliche, but Hawaii is extraordinary. Beaches, mountains, amazing food, big cities, small “country” towns, volcanoes, and waterfalls. All within 30 minutes of each other. With perfect weather year-round it’s truly paradise. 5. When was the last time you ventured over to the Garden State and what brought you there? My family and I recently moved to New Jersey. We have quickly come to love the Garden State. Although, long before that, I took a trip to Belleville with some local NJ friends to see Frankie’s old neighborhood. It was fascinating to see the housing projects where he grew up and the Belmont Tavern where he first took the stage. 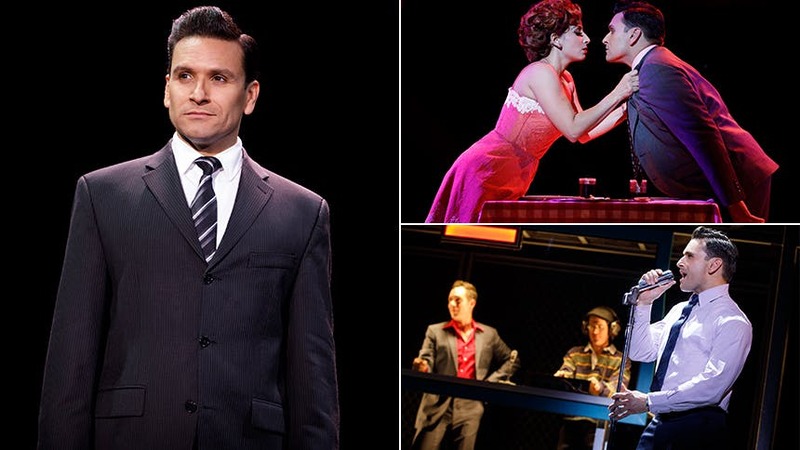 Don't miss Aaron De Jesus as Frankie Valli in 'Jersey Boys' at New World Stages.